Equine weight management can be a challenge at any age. Horses of all ages need targeted nutrition to meet their special needs. The senior horse is no exception. In order to keep older horses going strong, special attention is required in care, management and what’s in that feed bucket. While some older horses remain in good flesh and good health, feeding challenges can range from putting weight on the thin horse to slimming down the overweight horse. Here are some considerations at both ends of the scale, and tactics to keep your senior horse in fine fettle. 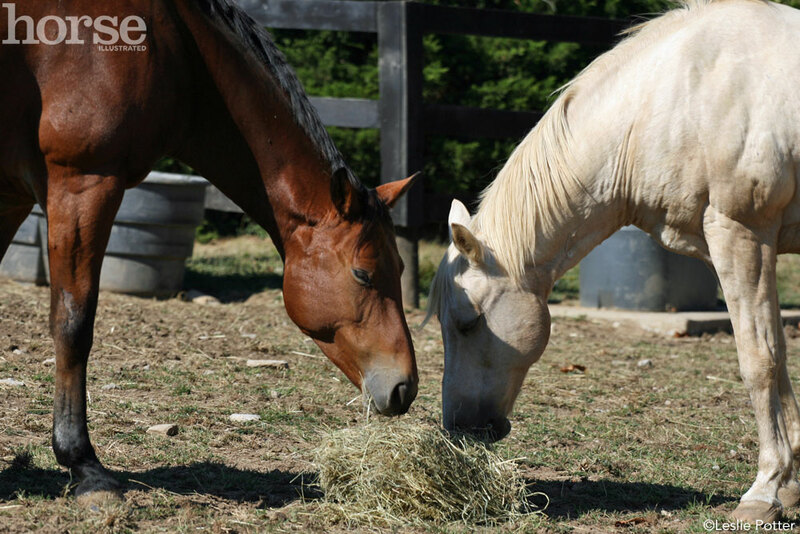 There are shades of body condition in between, but these guidelines should help you find a feeding strategy to address your senior horse’s specific needs. Some geriatric horses have difficulty holding their weight and condition. As Cody ambles in from the pasture, the sunlight catches on his red coat and all of a sudden you are aware that his ribs seem to be sticking out more than you remember. You are puzzled since he always has food in front of him, so a lack of groceries can’t explain why he won’t put on or hold his weight. He is still ridden lightly a few days a week, nothing too strenuous, hardly breaking a sweat. So, how do you determine the best way to go about improving his body condition? First off, you’ll want to focus on the most likely and simple reasons for his failure to gain weight. Have your veterinarian check his dental condition to make sure he still has plenty of teeth to chew his food. If teeth are missing or his mouth is sore because of impacted food material, or because of a tooth infection or periodontitis, he may be unwilling to grind his food effectively—during the digestive process, his system won’t absorb the necessary nutrients from partially chewed food. Or, because of dental discomfort, he may spend less time eating than what he needs. An older horse that is missing teeth or has little left for chewing may need some special attention to his diet—you’ll likely need to mix some pelleted feed and/or soaked beet pulp into a gruel. Another thing is to ensure that Cody has been on a regular deworming schedule. This keeps intestinal parasites from stealing nutrients from his system or interfering with efficient gut function. Winter weather also saps energy and calories from an older horse, especially a hard keeper. To help your horse hold his weight during the worst times of the year, provide him with shelter, blanket as necessary, and offer plenty of free choice grass hay. The extra forage gets digested in the “internal combustion chamber” of his large intestines where it generates internal body heat that will keep him warmer. Offering grain at these times does little to generate heat, whereas hay, the fiber component of his diet, will. Then, once these easily identifiable problems are taken care of, consult with your veterinarian about the specifics of Cody’s diet. A horse like Cody should receive all the hay he will eat. If it is difficult for him to chew hay or crop pasture, then he should be offered high-fiber supplements like hay cubes and/or complete feed pellets and/or beet pulp. In addition, Cody will thrive if supplemented with high-fat feeds, such as vegetable oil or rice bran. Pound for pound, high-fat food offers more calories than grain, and it is safer to feed than grain. Most horses can tolerate 1—1½ cups of oil or rice bran added to their supplemental feed (pelleted or cubed feeds) twice a day. If that amount of dietary fat causes Cody to back off his feed or to develop loose stools, then you can cut the amount of fat in half. The quantity of pelleted feed that should be offered differs for each horse, and you should discuss this with your veterinarian to tailor a diet specific for your horse. Many commercial products are available, all with good nutritive value, although remember that a horse can only eat about 2 percent of its body weight per day; for an older horse with a limited appetite, a higher fat (hence higher calorie) pelleted supplement will go a long way toward putting weight on his frame. Often, the horse can get the nutrients he needs from feeds specifically formulated with the senior horse in mind. Senior horses that need to gain weight often do well on beet pulp, as it is high in calories, high in fiber, and low in carbohydrates and starch. It comes in a pelleted form that should be soaked for about six to eight hours before feeding, or as an extruded form that can be fed dry. Most horses will happily consume 1 to 2 cups of dry beet pulp pellets (then soaked to volume) once or twice a day. Make sure the hard keeper has ample access to his food, and doesnÕt have to compete with other herd members to obtain his daily ration of groceries. A submissive horse can get chased away from the feeder, and by the time he is allowed back to it, all the hay is gone. Sometimes older horses have difficulty obtaining nutrients because of poor glucose absorption in their bowels. Your veterinarian can diagnose such problems through laboratory testing. In some cases, hormonal changes related to Cushing’s disease may also alter nutrient balance in a horse, causing him to seemingly starve to death. And, chronic pain can stress a horse to the point where he won’t eat or won’t gain weight, or both. A thorough physical exam and blood profile done by your veterinarian will screen for medical conditions that can cause weight loss or failure to gain. Assuming in this case that Cody only needs a little jumpstart on dental and dietary modifications, it shouldn’t be too hard to turn his condition back to that of his robust, younger self. Once you get Cody’s diet back on track, you should see him steadily gain weight. Over the next few months, you should just barely be able to feel his last two ribs beneath his silky coat. On the other side of the spectrum, there is the easy keeper that seems to absorb nutrients from the barest minimum of food. Regal looks mighty fine with his bay coat standing out against the green pasture, but when he wanders into the paddock for a drink your careful scrutiny makes you realize he is more than a little chubby. His frame is quite filled out, and admittedly you think that he fairly ripples with fat over his shoulders and rump, and his neck has a prominent crest. The obese older horse is not an uncommon phenomenon due to metabolic disturbances, such as tumors of the pituitary gland, related to age and aging or to hereditary issues like insulin resistance or equine metabolic syndrome (EMS). Blood work can be done and evaluated by your veterinarian to check for health problems that lead to obesity. In some cases, you might be overindulging your horse in well-intentioned attempts to offer tender, loving care. But too many calories simply turn to fat. In other cases, you may feed what seems to be a normal diet, but if your horse is an easy keeper that receives little exercise, the relative abundance of food turns into fat. Some older horses are so plagued by musculoskeletal problems like arthritis or laminitis that they are unable to be exercised and live primarily sedentary lives. Such individuals need to be fed a diet that is low in fat, sugars and carbohydrates. A high-fiber feed like grass hay should be offered. Alfalfa hay is too high in protein and energy, and its high calcium content is tough on old horse kidneys. You should invest in a scale to accurately weigh how much hay is fed in order to control the diet and your horse’s weight. Offering senior feeds to an already fat horse would be a mistake because they are loaded with caloric nutrients that could be detrimental to an obese horse. A horse with laminitis should especially be restricted in the energy quality and quantity of his nutrient intake. It would be counterproductive to feed such a horse grain. Grain is poorly digested in the small intestine, so when it gets into the large intestine it wreaks havoc with the digestive tract environment and sets up conditions for circulatory disturbances. This process leads to serious problems in older horses with already compromised feet. Older horses’ digestion may be less efficient at handling starchy grains than horses in their prime, and so seniors are more acutely affected by this type of diet. Usually, the best solutions to managing a fat or obese horse include exercise, exercise, exercise, and feeding fewer groceries and limiting access to pasture. For any obese horse, especially one that has musculoskeletal issues, other strategies must also be considered to reduce caloric intake. Now that you have recognized that Regal has a weight problem, with very careful management, you can get him slimmed down again to a more svelte figure. He’ll not only look better, but he will feel better, too, with more energy to cavort in his older years. Not all older horses have weight problems. Some senior horses continue to be ridden in athletic pursuits, and are able to be maintained in good physical condition. Such a horse needs to be fed just as you would feed a mature, healthy horse, with no special changes in the diet. Diamond is just such an example of a still-active athlete even though he is now in his mid 20s. He suffers from only minor arthritis, which is easily managed, and continues to be ridden three to four days a week in moderate work, teaching young riders about life with horses. His coat shines with health, his physique is trim and robust, and he has ample energy and vitality, seemingly still enjoying his job as a riding horse. Once a horse like this is moderately fit, it is easy to maintain him in a toned condition through regular exercise. 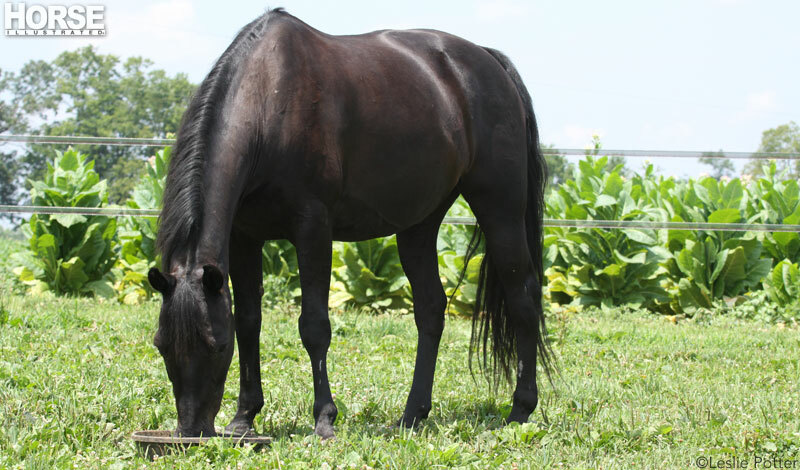 Feed at least 60 percent of the horse’s diet in the form of forage, such as hay or pasture. Minimize grain supplements, using high-fat feed and/or complete feed pellets and/or beet pulp to provide additional calories only when needed. Try to split the daily ration into three to four feedings. Provide water and salt free choice. Offer regular turnout, and exercise on a regular schedule. An older horse in good physical condition and weight is often difficult to tell from the teenage horse, and you will revel in people remarking on how amazing your horse looks in spite of his age! Keep track of your horse’s body condition through all seasons, periodically measuring with a weight tape and taking comparative photographs. Learn to feel where fat deposits might or should be, looking at the overall horse rather than just his topline. Feel across his torax; ideally you want to be able to just feel the last two ribs. Close observation of your horse’s physique on a regular basis enables you to continually fine tune dietary needs according to the level of your horse’s activity and in conjunction with weather concerns. Other than disease issues or metabolic conditions, there is no reason a senior horse can’t continue in a robust condition into his later years. Nancy S. Loving, DVM, is a performance horse veterinarian based in Boulder, Colo. This article originally appeared in the November 2007 issue of Horse Illustrated. Click here to subscribe. Great Advice and comes at the perfect time. Thank you! Answered alot of questions I had! Interesting! I hope that everyone’s Saturday is going great and safe!